When it comes to corporate innovation, it’s easy to focus on metrics such as ideas captured by an idea challenge, the number of prototypes developed or experiments run. But with most corporate innovation initiatives quickly degenerating into theatre, failure rates are running high (eg. 80-90% of innovation labs fail). 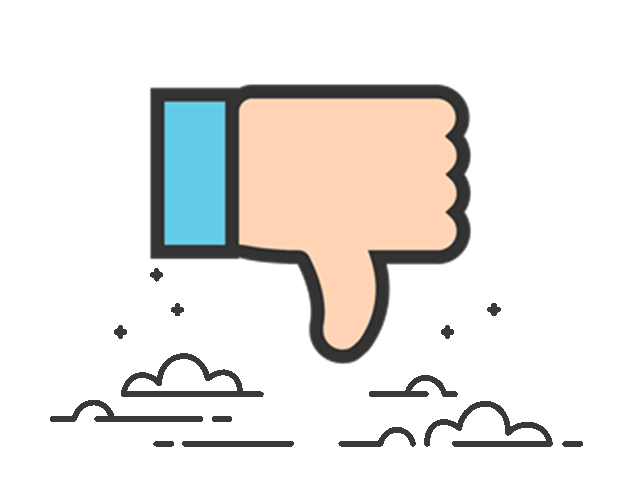 Such failures ultimately lead to senior stakeholders withdrawing their support while intrapreneurs become increasingly dissatisfied and leave the organisation to seek out greener, more innovative pastures elsewhere. This really hurts a company’s prospects for innovating in the long-term - something few companies can ill afford in today’s climate. Therefore you need to focus on the right innovation KPI metric. Corporates need to get more adept at identifying and monitoring the metrics that matter when it comes to their innovation programs if they are to avoid such pitfalls. Startups searching for product-market fit today do so by rapidly testing a large number of assumptions underpinning their solutions and business models - essentially the lean startup philosophy at its core. They take this approach because when we’re developing something completely new, you won’t have all the answers and the surest way to figure them out and give yourself the best chance of surviving long enough to do so is to take small bets across these assumptions. 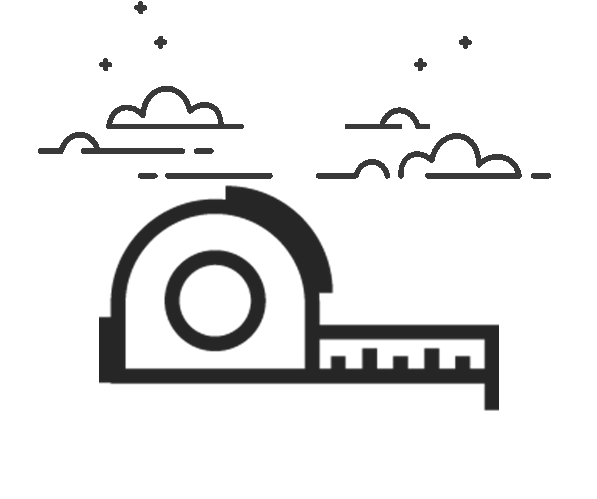 Figuring out how to innovate at a large bureaucratic, siloed, process-oriented, steering committee leaning organisation that has little track record of exploring disruptive innovation is also fraught with uncertainty and untested assumptions. As such, such companies can benefit from viewing the development of their innovation programs through a similar lens as startups developing something new with different approaches to innovation to see what works for them. But a ship without a lighthouse to direct it to shore is likely to crash. OMTM is a concept popularised by Ben Yoskovitz in his book Lean Analytics. Ben says that “it doesn’t mean that there’s only one metric you care about”. It does, however, mean that at any given time, there’s one metric you should care about above all else. He says in order to determine your OMTM, determine what kind of company you are, what stage you’re in and who your audience is. For a corporate innovation program, the company type is mostly redundant but the stage your innovation program is in and and to a lesser extent, the audience, matters. Ben breaks down the stages into attention, problem validation, solution validation, feature optimisation and business model validation. We can map these stages to the development of a corporate innovation program which can then help us identify which metric matters most at that particular stage of our development. 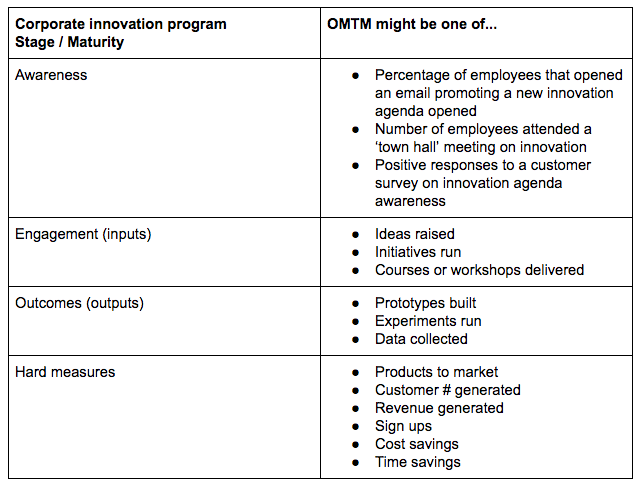 Based on this, we can shortlist some potential OMTMs for each stage of the innovation program’s maturity or focus. In the early stages of an innovation program, where you’re literally just focused on raising awareness and getting people to engage in innovation initiatives, then your OMTM might be the aforementioned input metrics such as ‘number of ideas’ raised or ‘percentage of workforce participated in initiative X’. Eventually you might move into focusing on output measures such as prototypes built and experiments run. However, like a startup making its way to product market fit, eventually you will be looking at hard metrics such as business model validation and revenue generated. But is there a risk of focusing on a OMTM at say the Awareness or Engagement stage of an innovation program at the expense of longer term metrics that we’re working towards? The NSM is a term coined by Sean Ellis of GrowthHackers.com and is a powerful concept that has emerged in recent years from Silicon Valley companies with breakout growth. It helps teams move beyond driving fleeting, surface-level growth to instead focus on generating long-term retained customer growth. When applied to corporate innovation, it helps keep teams focused not just on today’s metric that matters, but working towards tomorrow’s too, towards long-term sustainable growth. Ash Maurya kindly reminded me in this episode of the Future Squared podcast, the risk of focusing on one metric only is that it can often come at the expense of others. For example, if Airbnb only focused on nights booked and not nights returned, it may soon find that most of its customers have such a lousy experience that the well eventually runs dry. A focus on sub-metrics is key. In this case, Airbnb would focus on sub-metrics such as nights returned, amongst others. So what might the ultimate NSM be for corporate innovation programs be? The Growth Gap represents the gap between the organisation’s growth objectives and existing revenues. For example, based on extrapolating out our existing revenues to say, the year 2020 (adjusting for factors like inflation and new revenue not attributable to innovation efforts) what might the forecast gap be? One might forecast revenue of $5B and based on extrapolating out adjusted revenue from existing products and services we might be on track for $4.5B in revenue, providing economic, social and political factors don’t forsake us. The gap is therefore $500M. That is the growth gap that needs to get plugged with new revenues to meet our growth goals. When we think about what long-term sustainable impact and growth looks like for an innovation team we could focus on obvious metrics such as revenue, number of ideas to market, new customers generated and all would have some validity. But revenue and new customers can come from anywhere and there have been countless ideas implemented by companies around the world that tanked (hello Zune!). Innovation programs are set up, or should be set up, with the objective of helping companies survive and thrive in an era of rapid change. They should be tied to strategic objectives and growth targets. This is why using a metric such as the Growth Gap makes more sense than Revenue Growth alone and unlike most metric, we’re concerned with decreasing it, not increasing it. All the ideas and good vibes in the world generated by a design sprint or a hackathon won’t matter if, after a number of years, the growth gap isn’t plugged, which basically suggests that the innovation program delivering any long-term sustainable, measurable, tangible value that your audience - I’m guessing senior executives and shareholders - care about. For example, are new revenues coming at the expense of something fundamental to the company’s sustainability - such as customer service, reputation and compliance with regulation? 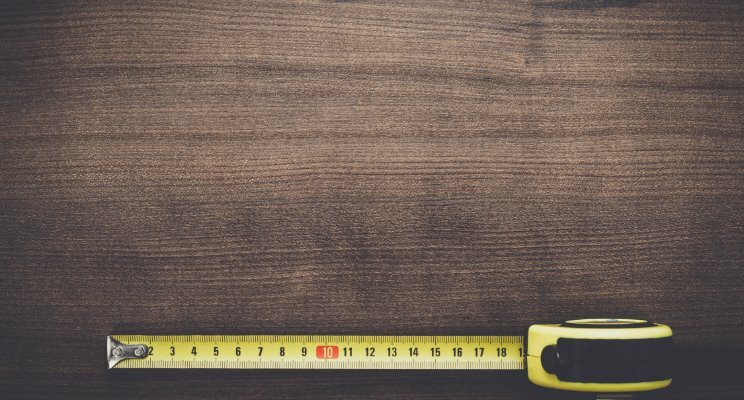 By defining and communicating your North Star Metric from day one, you are aligning the team’s long-term expectations and focus, and can monitor it on at least a quarterly basis in the early stages of your program, objectively answering questions such as “how likely it is that product X, Y or Z is going to materially plug the gap in 1, 3 or 5 years?”. 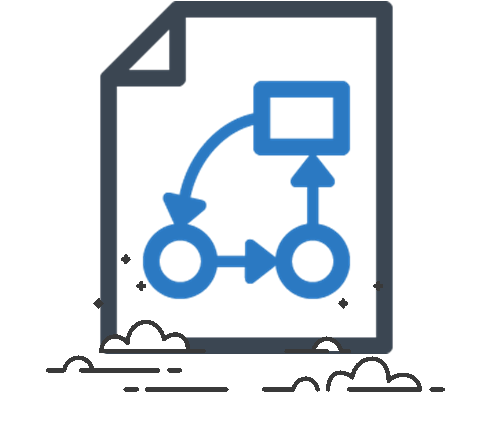 By using a combination of NSM and OMTM, you’ll decrease the risk of support for initiatives being withdrawn early but it will help avoid the possibility that you don’t find yourself five years in with all sorts of noteworthy input and output measures to report on but not having moved the needle on what matters most, plugging the Growth Gap.